This is the first time I've had a chance to just sit and open my laptop since Thursday night. I'm not used to all of this social activity, but it's silly for me to write a pity party post since it's all self inflicted! Friday evening we went to see Amy Schumer and it's been all downhill since then. Four family Christmas-related events, two of which were hosted at our house. Plus Christmas shopping, then packing for my California trip this week. I swear Christmas has just got to be a thousand times more stressful when you have to travel on top of all the inherent craziness! I wore this outfit yesterday for a Santa breakfast, last minute shopping, and then Christmas dinner and gift exchange with the immediate family. I honestly didn't mean to wear this for dinner also, I wanted to dress up a bit, but I didn't have a choice because I quickly ran out of time! I say it's self inflicted because it's my choice to write this blog post for you a half hour before the linkup goes live. It was my choice to book the trip to spend the week with my family. It was my choice to ask for my father-in-law's labor to renovate my bathroom starting this week while we were out of town, prompting me to have it cleared out before our trip. It was our choice to offer our house for the two family events this weekend. So, although I'd be lying if I said I wasn't deathly tired, I really cannot complain. I should be thankful I have these choices and all of the loved ones that want to spend time with us during the holidays. And I'm thankful for all of you that care what I'm wearing when I'm up to my eyeballs in commitments and tasks! That said, hope you all have an awesome Christmasweek! I think that's a lovely outfit for dinner! The print mixing looks great, it all works well together. I hope you'll get some time to relax at Christmas. December has been a busy month for me too socially. Love your effortless chic look with those fun and festive colors. Love this casual but trendy look!! That bag is still everything!! Cozy yet festive layers CArylee - Have a very Merry Christmas! What an awesome, cozy scarf! Yes, it's been a busy, crazy season for me too, but I think things are gonna slow down a bit now and I can start enjoying the holidays. In love with this whole look! that sweater looks so cozy!! You layered everything so perfectly! Great perspective....I always have to remind myself how much of my crazy is self inflicted. God made me this way...I don't do well with down time. :) Merry Christmas...have an amazing trip! Isn't it wild how busy the holidays are? It is really fun though, just tiring! 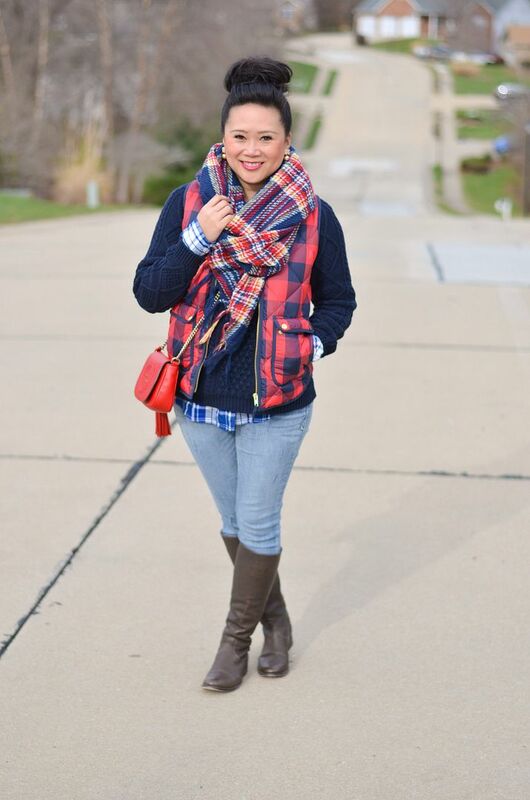 I love how you layered this plaid scarf over the buffalo print vest. I totally agree that having to travel makes the holidays more stressful! We have to go to Nebraska and although that's not that far it still takes a lot of coordination! It has been a busy time! I keep reminding myself to stop and enjoy it. Great outfit! I hear you! The past two weeks have been CRAZY. We are trying to wrap up a renovation and also had a stomach bug go through the house. UGH! I hope you have a great trip and get to relax. Thanks for hosting the linkup. I LOVE this outfit. Such a great color palette! 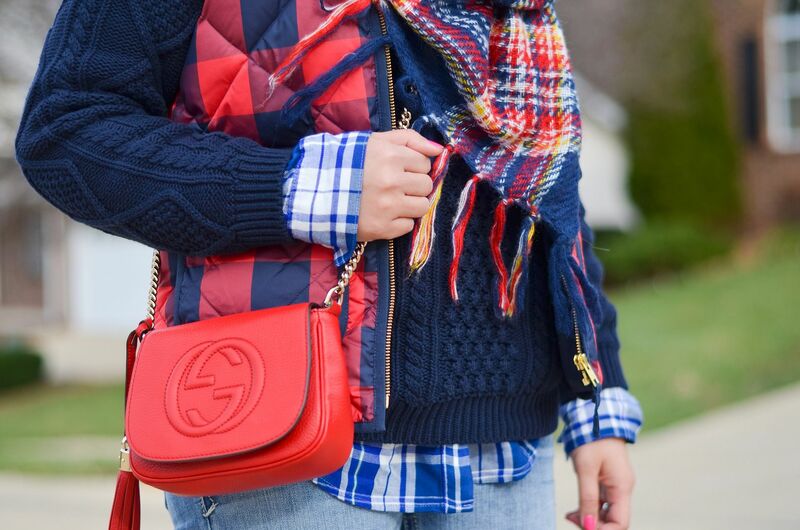 I love red and navy together, and this outfit looks fabulous on you! 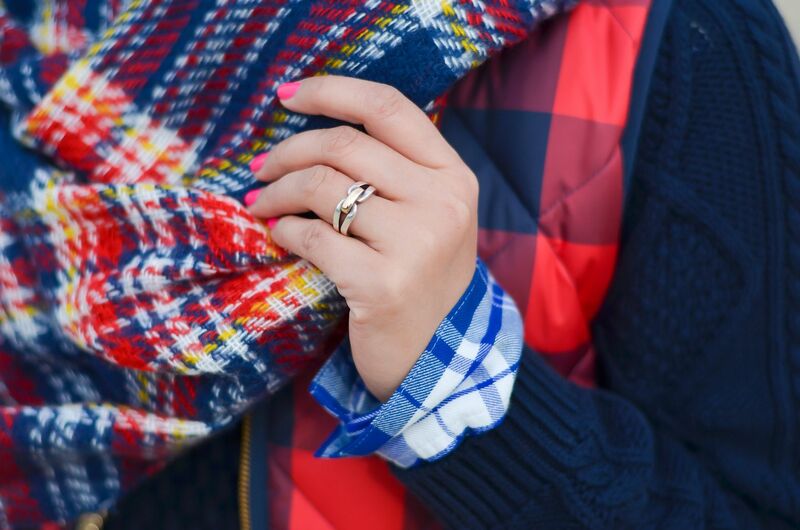 Love your plaid on plaid on plaid - very cool! Thank you for hosting. Great look! Love all the colors! Those colours look great on you! Love that combo together. Oh my gosh so jealous of you getting to see AMY! How fun! We have avoided holiday travel the last few years because it's so hectic, especially with little kids. But then it ends up being a little lonely when everyone else is with family, so it feels like one way or another you can't win! Hope you get all your shopping done in the next couple of days!! 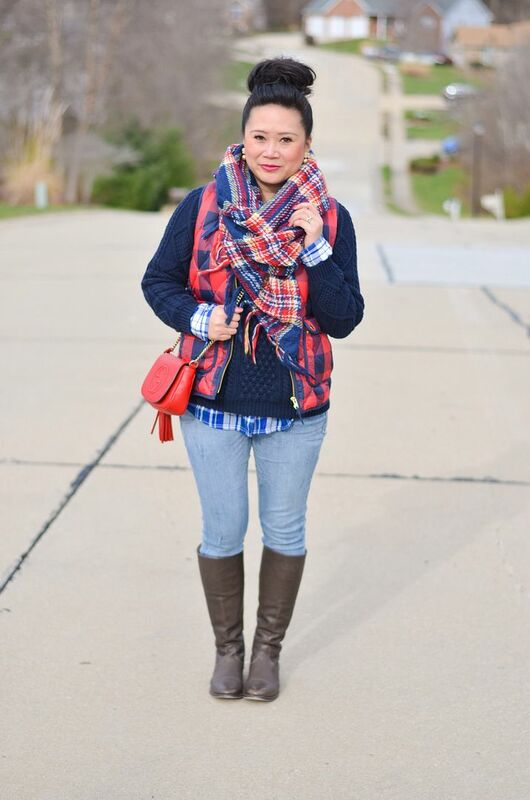 Love this cozy look! That scarf looks amazing on you! Love this look! Enjoy the holiday!